The digital version of The Humanities Matter! is a large, vertical-format banner available as a PDF file. A limited number of printed posters made from the infographic is being mailed to newspapers and magazines, national councils and commissions, public and private funding agencies, humanities centres and programs, and digital-humanities associations and programs around the world. As a follow-up to the UCL Centre for Digital Humanities’ “Quantifying Digital Humanities” infographic from 2012 (PDF), The Humanities Matter! starts a more expansive effort by the Center and 4Humanities to gather statistics and create infographics about the humanities. The Humanities Matter! is part of the 4Humanities Humanities Infographics initiative, including Infographics Friday online posts. 4Humanities invites additional statistics (including from more parts of the world) so that it can expand the infographics initiative and, funds allowing, produce future versions. The Humanities Matter! was created by the UCL Centre for Digital Humanities under the supervision of its director Melissa Terras, who is also a co-leader of 4Humanities. Terras collected data for the infographic with assistance from Ernesto Priego (an international correspondent for 4Humanities), Lindsay Thomas (lead research assistant for 4Humanities), Victoria Smith (research assistant, Humanities Computing, U. Alberta), and the other co-leaders of 4Humanities: Christine Henseler, Alan Liu, Geoffrey Rockwell, and Stéfan Sinclair. 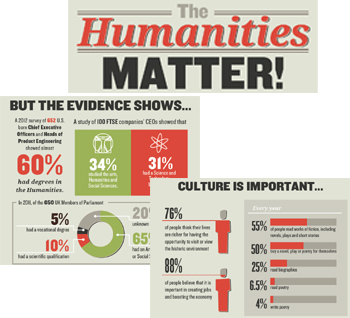 Please download The Humanities Matter! and help 4Humanities circulate it ; feel free to print in small or large format and distribute. The Humanities Matter! is licensed under a Creative Commons Attribution 3.0 Unported License.